Take the time to genuinely listen to your employees. Doing so will show you care about your employee’s well-being. It’s essential that you get feedback from your employees, the “day-to-day tasks,” is where they may have more knowledge and have more expertise than you. It’s to your advantage to get feedback from these employees, so you can make improvements and become aware of problems and issues. Don’t play favoritism with your employees. When you treat your staff equally you will have better control of your department. It’s important that you respect your co-workers! When you treat your staff with respect, you will most likely gain respect. When an employee brings an issue to your attention, it’s best you deal with it as soon as possible. If you can’t solve it immediately let the person know you are looking into the issue. When you need to make changes you should involve your employees when the change affects them. this will benefit you in three ways. One: You will receive feedback from your employees. Two: When you involve your staff they feel more important. Three: Your employees know a change is coming and will accept it more than if you made the change without them. When you need to make decisions, get the facts before. Making a decision without having the correct information will most likely result in problems. When an employee tells you about a problem with another employee, make sure you get both sides of the story before acting, or you may look foolish. It’s not that people will always be lying, but the way they perceive the situation may not be the case. Listening to both of the people involved will help you determine the true situation. When you’re faced with a difficult decision. You can make it easier by doing the right thing. Sometimes it’s that simple. When you know what’s the right thing to do, then you don’t waver in your decision-making. If you treat some employees’ better than others it will cause problems in your department. It’s wise to treat your employees equally, with regards, to rights, and respect. If you want to reward your top employees then you can put a rewards program in place instead of playing favorites. One of the best ways to improve employee loyalty and respect is to make sure you are giving them credit when they deserve it. If I take this direction what will happen? If I take this action what will happen? Doing so will help you expect multiple outcomes. You need to take responsibility for your actions. That sets an example for your employees, and shows you are a responsible boss. You can’t do it alone. You need to have a trusted team you can trust to run ideas by them to get further insight. It’s a good idea to look at your employees from their perspective. You do you need them to do an undesirable job? Would you do it? Is there a way to make that task easier? You need to figure out if your employees are in the correct positions. It will benefit everyone when the you have the right person in the right job! People work differently, you need to allow your employees to work they way they work best. Some people find it hard, being restrained to a desk and need to go for a two minute walk every hour. You might have a person that does a great job scheduling and managing certain departments, but has terrible communication skills, then you canÂ cutÂ the major communication tasks and increase the tasks they excel in. Many times time off is more important to employees that money. When your employees need time off, do your best to accommodate them. Keep in mind they have a life outside of work plus a happy employee is a more productive employee. Allow your employees to enjoy a relaxed environment. You shouldn’t make your employees afraid of you and providing a relaxed environment will help keep your employees productive. That being said it doesn’t mean your employees break rules and don’t do their work, it just provides less stress. When a task needs t completion. Ask your employees if they can take care of it. When someone breaks the rules or makes a mistake you need to talk to them about the start of by we have this issue and can we fix it? You may have a good relationship with your employees but make sure you keep it professional. This will keep future problems from sneaking up on you, such as; you become too friendly with your employees and they try to take advantage of that. When you have changes, or tasks no online likes doing, you can explain why the change, why, the task needs someone to do it. When you explain, “why,” people bring down their resistance because they understand the reasoning. When someone brings you an idea, listen and thank them for the idea, if you use it or not. The benefits to this is that you allow your employees to keep bring you new ideas, you don’t shut down their creativity. The second benefit when you allow the flow of creative ideas you are sure to come across a few that will prove to become excellentÂ ideas. Just because you are a boss, that doesn’t mean you better than the people you manage. You have a job to do and so do they. You have better management skills and the have some skills that are better than you. Think of it as being equal with different job functions. 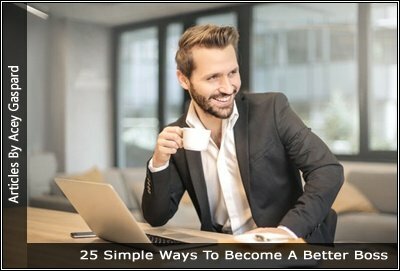 Previous article4 Minutes to Feeling Better About Your Life!